French missionary, Armand David brought a panda pelt back to Europe in 1869. He wrote in his diary that he saw a beautiful pelt from a 'black-white bear' in a local hunter's home and the hunter sold the fur to him at a very high price. David was the first to let the westerners know of the existence of this rare animal. The fur was exhibited in the French National Museum in Paris and it was formally named the 'Giant Panda'. Since the early 20th Century, there have been many western explorers penetrating into Sichuan and Tibet to look for this special creature. 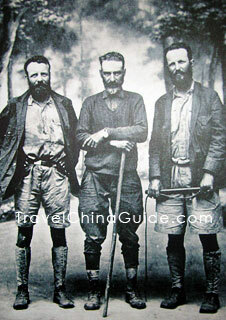 The most famous is the expedition team led by Theodore Roosevelt's two sons. 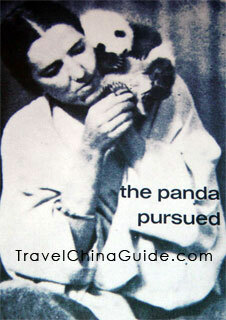 In December of 1936, an American fashion designer brought a 3-month-old baby panda (Su Lin) to America. It was registered as a puppy when Su Lin boarded the ship to America. That was the first living panda went to the western world. An enthusiasm grew for panda in the western world, the Chinese authorities' inadequate understanding of its rarity led to the loss of many pandas after Su Lin. They realized its value in the western world later. In 1941, Soong May-Ling (Madame Chiang Kai-shek) gave a pair of pandas to the Americans in appreciation for their help to China. It was the first time that China delivered any live panda in the name of the government. In total, Chiang's government presented 14 to various western countries. The British government asked for a panda donation in exchange for providing a master's degree in zoology to China free of any charge. A teacher in Sichuan University spent half a year finding a female one. London Zoo once had three from early animal traffickers but they died successively. 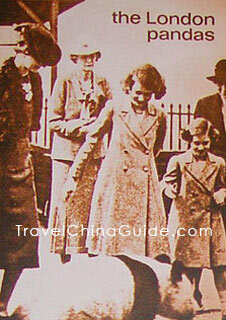 In 1946, Panda 'Lien Ho' and a Chinese biologist arrived at London. For the first time, China received substantial interest in its pandas. Since that time, pandas have shown up in the west mostly as a political gift. The Chinese people realized the rarity of pandas after the establishment of the new China in 1949. The poaching of wild giant pandas was strictly prohibited. They became the ambassadors of peace. As a goodwill ambassador, its value in politics was not new. In Japanese history, Wu Zetian, Empress of the Tang Dynasty (618 - 907), sent two bears and seventy pieces of fur as a national gift to Japan. The two bears were believed to be pandas according to textual research. The panda's diplomatic career formally began in the 1950s. China sent 23 to nine countries from 1957-1983. No diplomat could be more radiant than pandas. For a long time after 1949, the giant panda was only granted to allied socialist states. Western countries like Britain and America could not be allowed to get any. In 1958, an Austrian animal dealer swapped three giraffes, two rhinos, two hippos and two zebras for one panda from Beijing Zoo. That one was Chi Chi who was meant to be sent to Chicago Zoo, but prohibited from entering due to her socialist background. Chi Chi moved to London Zoo finally and became a big star of this zoo. She is exactly the prototype of the panda on WWF's logo. Entering the 1970s, giant panda as diplomatic gifts reappeared in the west as China established formal diplomatic relations with more and more western countries. Five descendents of those 23 are still alive, including one in Japan, three in Mexico and one in Germany. The ownership belongs to these countries. Increased consciousness of the need for rare endangered wildlife protection called for a lull in panda donations as political gifts to any other countries since 1982. They now can only be invited to visit other countries on a 10-year-load basis for scientific research purposes. Their offspring born abroad will come back to China when they are three years old. In the western world, there are still 14 ones. Do you have information on the loaning process of giant pandas to US Zoos? Who is in charge? Where do those pandas come from? Hi, I know in 1972, two pandas named Xingxing and Lingling were sent to the National Zoological Park in Washington as gifts, but they died later. Then in 2002, another two pandas named Meixiang and Tiantian were sent to the same zoo. They still live in the park now. The loaning program is in the charge of the governments of China and the country who loans pandas. It is diplomatic affair to some degree. And the loaning pandas mainly come from Chengdu Panda Breeding and Research Center.